I'm working on using up crumbs or strings every weekend. I started back earlier this year when I realized I wasn't getting anywhere with my strings or crumbs, but instead they were just sitting in their bags - being added to, but never subtracted from. So I decided that I needed to devote at least one good sewing session each weekend, if at all possible, to using them up. More than one session was fine - and if "life happened" and I couldn't get to it, then that was okay too. But it was/is a goal. So far I've finished 2 strings tops and I'm making good progress on this crumbs top. 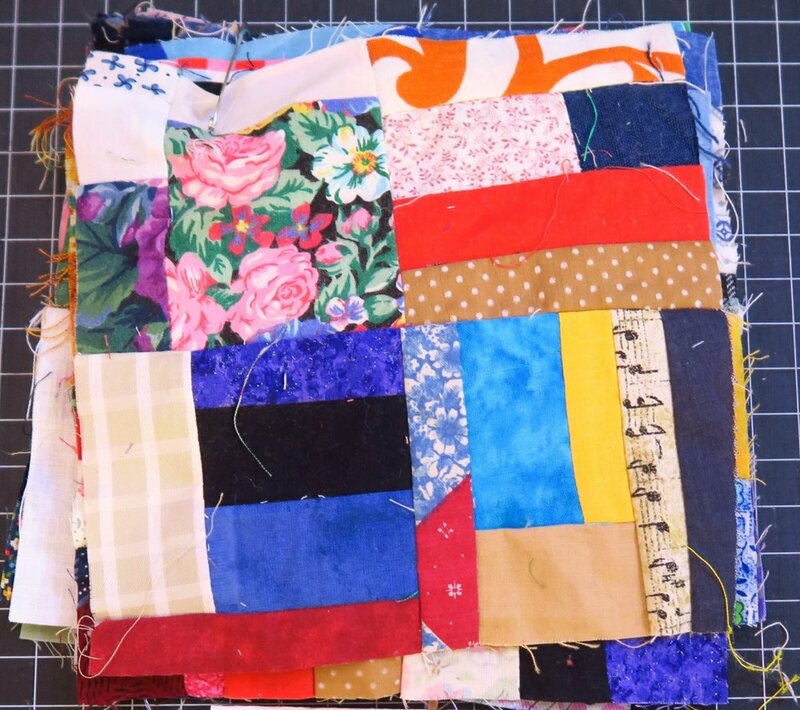 If you are new to reading this blog, then you can check the strings quilt tops here and here. I do have Strings 3 in the works, but decided to take a hiatus from that and work on crumbs for a while. I actually spent quite a bit of time on it this weekend. Part of the reason is that I finally know what I want to do. I have a plan. Secondly, I recently finished a few "big tops" and I felt like I was at a good break from that and didn't feel pressure (from myself) to do anything else. Plus, I always like it when I start to feel like I'm almost done with a top - or at least making really good progress. 1. Sewed the 3.5" squares into 6.5" blocks. I made 42 total. I had 10 already finished from a previous time. 2. Added a black frame to the 6.5: blocks so they are now 9.5" blocks. 3. Made 30 - 3.5" 9 patches with gray in the corners. 4. Cut sashing pieces and went ahead and put 3 rows of the quilt together. 5. Made a bunch more "made fabric pieces from crumbs" that need to be trimmed down. They are for the border. fI ran out of steam for the project this weekend -but I probably spent 6 or 7 hours on it total. Strings and crumbs are S-L-O-W going - that's why I am more or less "making myself" work on them. The reward doesn't come quickly. I simply folded the whole works and put it away til next weekend. I'm still thinking about exactly how I want to do the border.I'm thinking about solid "crumb blocks" - instead of pieced ones. Here's my diagram/plan for this crumbs quilt. And that's what I've been up to this weekend! And here you are - just in case you need something for your own project from the store - here are some almost whites that might interest you.